A circulator for sound. The arrows represent acoustic signals flowing through the device (diameter: ~20 centimeters), which circulates sound in a nonreciprocal fashion: Signals can flow from left to top, from top to right, and from right to left, but not in the opposite directions. This creates one-way communication channels for sound, allowing listeners to hear but not be heard in return. Credit: Erik Zumalt, Cockrell School of Engineering, UT Austin. A team of researchers at The University of Texas at Austin's Cockrell School of Engineering has built the first-ever circulator for sound. The team's experiments successfully prove that the fundamental symmetry with which acoustic waves travel through air between two points in space ("if you can hear, you can also be heard") can be broken by a compact and simple device. "Using the proposed concept, we were able to create one-way communication for sound traveling through air," said Andrea Alù, who led the project and is an associate professor and David & Doris Lybarger Endowed Faculty Fellow in the Cockrell School's Department of Electrical and Computer Engineering. "Imagine being able to listen without having to worry about being heard in return." 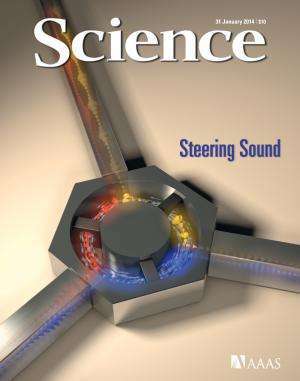 This successful experiment is described in "Sound Isolation and Giant Linear Nonreciprocity in a Compact Acoustic Circulator," which will be featured on the cover of Science in the Jan. 31 issue. An electronic circulator, typically used in communication devices and radars, is a nonreciprocal three-port device in which microwaves or radio signals are transmitted from one port to the next in a sequential way. When one of the ports is not used, the circulator acts as an isolator, allowing signals to flow from one port to the other, but not back. The UT Austin team realized the same functionality is true for sound waves traveling in air, which led to the team's building of a first-of-its-kind three-port acoustic circulator. Romain Fleury, the paper's first author and a Ph.D. student in Alù's group, said the circulator "is basically a one-way road for sound. The circulator can transmit acoustic waves in one direction but block them in the other, in a linear and distortion-free way." The scientific knowledge gained from successfully building a nonreciprocal sound circulator may lead to advances in noise control, new acoustic equipment for sonars and sound communication systems, and improved compact components for acoustic imaging and sensing. "More broadly, our paper proves a new physical mechanism to break time-reversal symmetry and subsequently induce nonreciprocal transmission of waves, opening important possibilities beyond applications in acoustics," Alù said. "Using the same concept, it may actually be possible to construct simpler, smaller and cheaper electronic circulators and other electronic components for wireless devices, as well as to create one-way communication channels for light." This research may eventually allow for an "acoustical version of one-way glass," said Preston Wilson, acoustics expert and associate professor in the Department of Mechanical Engineering. "It also opens up avenues for very efficient sound isolation and interesting new concepts for active control of sound isolators." At the core of the team's sound circulator is a resonant ring cavity loaded with three small computer fans that circulate the airflow at a specific velocity. The ring is connected to three ports outfitted at each end with microphones that record sound. In their experiment, the researchers start by transmitting sound from one port, for example, Port 1. If the fans are off, the sound signal from Port 1 splits symmetrically into the two receiving ports, Port 2 and Port 3, as expected. However, when the researchers turned the fans on and delivered a moderate airflow into the ring, with specific velocity tailored to the ring design, transmission symmetry was broken and the signal from Port 1 would flow entirely into Port 2, leaving Port 3 completely isolated. Conversely, when a signal was sent from Port 2, it would flow into Port 3, leaving Port 1 isolated. Acoustic signals then flow from Port 1 to Port 2, from Port 2 to Port 3 and from Port 3 to Port 1, but not in the opposite directions (see figure). "It is just the right spin of fluid (air) coupled with the strong resonance of our ring cavity, which makes our design powerful," Alù said. "These two combined mechanisms create strong nonreciprocity in a compact device. Sound waves are routed in one direction only—always contrary to the direction of the airflow." The UT Austin team believes their basic design for this first-of-its-kind sound circulator can be easily scalable to different acoustic frequencies. UT Austin has filed a provisional patent on the device. The team includes Department of Electrical and Computer Engineering postdoctoral fellow Dimitrios L. Sounas and graduate students Romain Fleury and Caleb F. Sieck. The team also includes Michael R. Haberman, a researcher in the Department of Mechanical Engineering and UT Austin's Applied Research Laboratories. Alù and his team are now working on a design for the sound circulator that does not require moving parts. In a parallel research line, they are also working on translating these concepts to realize novel nonreciprocal components, such as circulators and isolators, for radio waves and light. More information: "Sound Isolation and Giant Linear Nonreciprocity in a Compact Acoustic Circulator" Science, 2014. I suspect this only works at one frequency. It's an important piece of information missing from the article. Congratulations UT of Austin researchers. A possible solution to 'objective' tinnitus'. cease to exist. This unmasks or marks origins of 'subjective' tinnitus. Expect research to this approach in the coming years.